There was much excitement in and around Edgefield during the week of July 9-14. 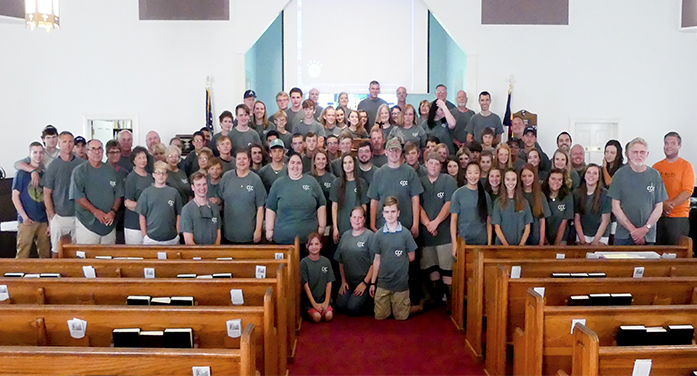 Members from the twenty Southern Baptist churches that make up the Edgefield Baptist Association engaged in a week of service and ministry. Over 140 missions volunteers came together to conduct ministry projects and repairs to local homes.This is the 8th year of Churches Changing Communities, CCC, and each year has been a blessing to participants and to the recipients of the help. In CCC 2017, members from the churches accomplished 17 construction and repair projects in local homes in four counties, and conducted ministry in eight locations. “This wonderful week of ministry and local missions would not have been possible without the excellent organizational skill and tireless effort of Mrs. Jackie Ridings, who led the preparation and administered the week,” said Rev. Tim Shull, Director of Missions for Edgefield Baptist Association.